David Tennant may have two BAFTAs versus Benedict Cumberbatch’s zero, but the Oscar-nominated Sherlock star has got a leg up on the Tenth Doctor in the edible art department. In a somewhat bizarre promotional campaign by Britain’s UKTV, Cumberbatch narrowly beat out Tennant by a margin of just one percent to be named “TV Dishiest Drama Actor.” The prize? A life-sized statue, made entirely of Belgian chocolate. 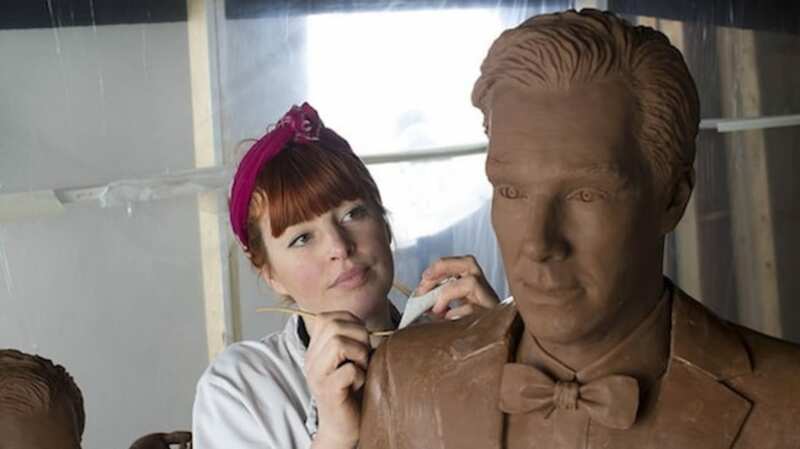 It took a team of eight people to construct the delicious doppelgänger—dubbed “Benedict Chocobatch"—and it will be on display at London’s Westfield Stratford City shopping center on Friday. Among the members of that team are a sculptor, chocolatier, and model maker, who put in more than 250 man-hours to replicate Cumberbatch as a confection. The final creation stands six-feet tall, just like Cumberbatch, and weighs approximately 88 pounds, which is about half as much as the man himself. The only question that remains: Do you eat Benedict Chocobatch ears first, or start at the feet?